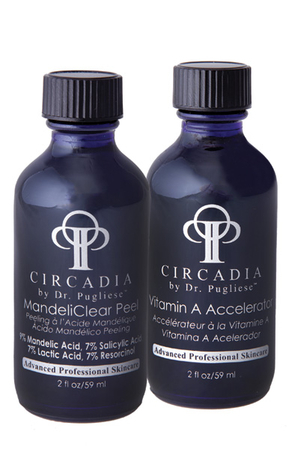 The MandeliClear Peel System was developed specifically for attenuating pigmentation issues associated with darker Fitzpatrick skin types. The system can be classified as a modified Jessner, containing 7% lactic, 7% salicylic and 7% resorcinol, in an ethanol base with quillaja bark. It also contains 9% mandelic acid, which is often derived from almond and wild cherry sources. Mandel is German for almond. This peel is safe, gentle, and well tolerated by most skin types. – Fitzpatrick I, II, III. Fitzpatrick IV and V requires pre-treatment. – Effective for lightening pigmentation due to acne, melasma or photodamaged skin. – May be repeated every 2-3 months.